Four funny black and white Atlantic Puffins stand on guard at the edge of Bird Rock in the Bonavista Peninsula in Newfoundland Labrador as we snap a picture. 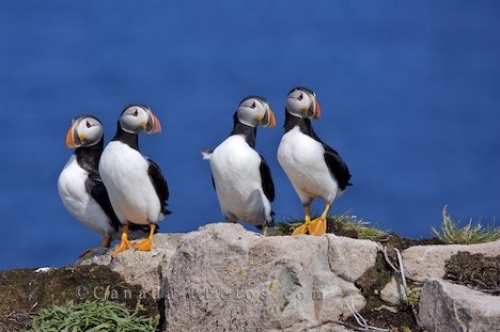 Most of the time Atlantic Puffins are venturing through the ocean waters but we were lucky to capture a picture of these four funny little puffins atop a rock ledge. This ledge is known as Bird Island situated in Newfoundland Labrador and the Atlantic Puffins spend some time here breeding and nesting. Picture of funny little Atlantic Puffins on the top of Bird Island along the Discovery Trail in Newfoundland Labrador, Canada.